Good People: Meet Alice Clay, Massage Therapist and Activity Assistant - Grace Ridge Retirement Community - Morganton, N.C.
As Grace Ridge celebrates 30 years of good moods, good times and good life, we are shining the spotlight on the people who make up the heart of the community: our dedicated and compassionate employees. Today, we highlight Alice Clay, who is a massage therapist and activity assistant. Alice has worked at Grace Ridge for 17 years, starting as an activity assistant and then working her way through massage therapy school. 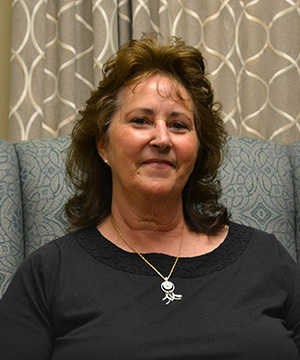 Alice is very proud to know that she makes a positive difference in the residents’ lives through massage therapy and assisting with activities that Grace Ridge offers. She said she enjoys working with the residents at Grace Ridge because each day is different. Alice approaches each resident as a unique individual with individual needs and likes. These differences allow her the opportunity to personalize her services to meet the residents’ specific needs. If Alice didn’t work at Grace Ridge, she feels like she would have missed out on what she describes as “the best job ever,” – working with wonderful people. One of Alice’s favorite memories during her tenure at Grace Ridge occurred when her teammates and residents surprised her with a 50th birthday party. She was so overwhelmed that she started to cry. One of the residents said, “Hon, don’t cry! You need a tissue.” Then, the resident jokingly pulled out a maxi-pad from her sweater sleeve, which made everyone laugh. Alice has been recognized multiple times for her outstanding work with Grace Ridge, including an award of merit and recognition for 15 years of employment. When Alice isn’t working, she enjoys gardening, growing flowers and playing with her dog. Thank you, Alice, and all of Grace Ridge’s outstanding employees!